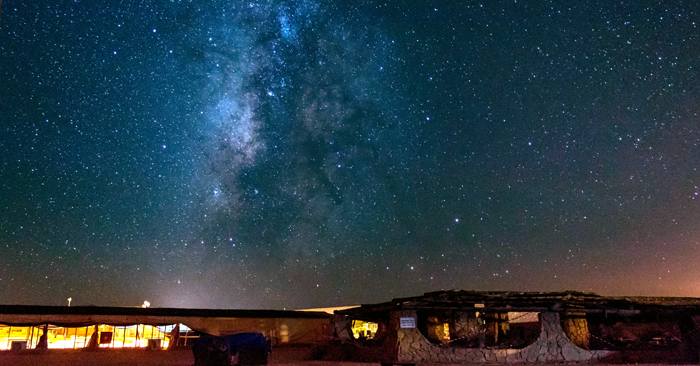 The Milky Way sets over the Beerot Khan camping site in Makhtesh Ramon. Photo by Wikimedia Commons user MinoZig. IDA today recognizes a major step ahead in the International Dark Sky Places Program with the first designation in the Middle East. Ramon Crater Nature Reserve in the Negev desert of southern Israel, under the management of the Israel Nature and Parks Authority (INPA), is the world’s newest International Dark Sky Park. This international title recognizes those sites around the world where the night sky is maintained in its natural state, preserving the unique appearance of the starry night sky in all its glory, for ecological, astronomical and cultural reasons. So far, only 54 other nature reserves and parks have been awarded this title in 15 countries around the world. Israel’s distinction is the first to be earned in the Middle East. The Ramon Crater is part of the nature reserves of the Tzinim Cliff and the Negev Highlands, and it is the largest and most impressive crater of the three unique erosion craters in the Negev desert. The genesis-like landscapes of the Ramon Crater include geological formations that are unparalleled in the world, and tell a fascinating story about the geologic evolution of the Earth. The desert landscape in Ramon Crater is breathtaking especially at nightfall. The crater is known to have an exceptional quality of star-studded sky and a natural undisturbed night environment that allows not only the development of a unique ecosystem but also a unique human night experience. The Ramon Crater International Dark Sky Park places Israel on the global front in terms of environmental thinking on the subject of reducing light pollution, a matter that has only recently become of great importance to the environment, human beings and the global economy. The INPA won international recognition after three years of scrutiny and examination by the IDA. Thanks to the quality of the night sky found in the reserve at the strictest level required by the organization, a unique lighting program for the area in the campground, alongside a diverse educational program that will be popularized. This recognition defines the western Ramon Crater as an undisturbed core area, and the eastern part of the crater as an area where the Authority allows visitors to enjoy a unique nighttime experience within campgrounds adapted to minimize light pollution, combined with educational content on astronomy and nature at night. One of the most important elements of the proposal is the many letters of support received from organizations, including research institutions, local and regional communities and professional associations that are connected to the Ramon Crater and to the preservation of the night sky, who added their support for the announcement of the Ramon Crater. The activities of the INPA in the Nature Reserves and National Parks have received international recognition for a unique, scientific, ethical and educational approach to nature conservation, which is the best model for protecting nature reserves and making them accessible to the general public.